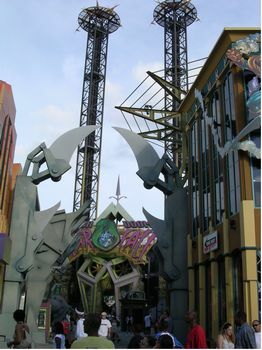 Doctor Doom's Fearfall is a drop tower in Marvel Super Hero Island at Universal's Islands of Adventure. It's worth seeing on a time-permitting basis. The minimum height to ride is 52 inches. A rather standard up-and-down launch-and-drop ride. There’s not much story or theming here, but the views of the park are superb — assuming you are brave enough to keep your eyes open at the top of the 199-foot tower, from where you will drop 150 feet. They have this type of ride at every single park/fair/carnival in the world now. If you have never done one of these rides before, then do it, otherwise it's pretty much the same 5 seconds of thrill as any other one. Boring. All it does is launch you up in the air, strand you up there for 30 seconds & drop you back down!